Though the exact date of arrival of the SVG descendants is April 12, the students marked the event with an activity on April 19, with the support of the Embassies of SVG, Honduras, Belize, Costa Rica and Guatemala, countries in Central America which all have Garifuna communities. The historical cultural event saw the Garifunas make a grand entrance into the open air amphitheatre with a moving procession of ceremonial song and dance to the rhythm of drums and carrying incense to purify the atmosphere. During his address, SVGâs Ambassador to Cuba Dexter Rose retraced the history of the Garifunas in their native Youroumien and their role in ensuring that their territory was the last in the Antillean chain to fall to British colonial designs. He made the point that while slavery had been well entrenched in the rest of the Caribbean, the Garifunas kept their country free up to 1795. He quoted from research by Vincentian historian Dr Bernard Marshall in his book Slavery, Law and Society, (translated into Spanish and published in Cuba), which showed the Garifunas as a people who conducted commerce in tobacco with the French before St Vincent was formally conquered. Putting the two Carib Wars against the British in context, the Vincentian diplomat pointed out that at a time when the British were losing their 13 colonies which became the United States of America, that colonial power could not stomach the resistance coming from the Garifunas and Caribs on St Vincent. The Ambassador also made the point that black people need to be reminded that they did not descend from slaves, but from a proud race of Africans who were enslaved at one point in their history. 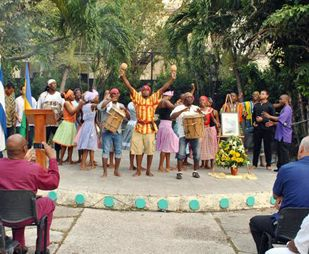 The Garifuna students of Honduras, the majority of whom are medical students and doctors specializing in various areas, have, during the twelve years since they began receiving scholarships to study in Cuba, been commemorating April 12, which marks the date of their arrival in Honduras from SVG with events among students. Fridayâs activity was attended by members of the Latin American and Caribbean Diplomatic Corps, members of the African Corps, Cuban government officials, deans and lecturers of various medical schools and students.